Well, can it, when it is in direct contact with the components and circuitry? The best generic term is "Silicone Rubber". I'll refer to it as SR for brevity. SR is a good to excellent encapsulant that has limitations (as does everything). It is not essential to use an electronics grade SR - these are usually dearer and may have Mil Spec ratings which are not essential. BUT see below for what IS essential. For electronics and anything liable to be corroded you MUST use "neutral cure" SR.
You can buy acid cure SR which exudes acetic acid as it sets. If it smells like vinegar then it's acid cure. Do not use "acid cure" silicone rubber for electronics. Neutral cure SRs will always say "neutral cure" or similar on the container. if they do not say this or similar they will be acid cure. There are 2 main types of neutral cure SR (= NCSR) in common use. There are a number of other NCSRs but you will almost certainly not meet them. Oxime cure is the cheaper and most common NCSR. It releases oximes and usually also methyl alcohol as it sets. Ventilation is needed and some people may get excema skin reactions. The oximes can corrode bare bright copper during curingh but this is usually not a major problem. Oxime cure NCSR does not bond to polycarbonate plastic. Alkoxy NCSR is more costly and the better grades of NCSR are alkoxy. It releases methyl alcohol as it sts. This can be 5% - 10% by volume ! so ventilation is an extremely good idea. It is good to work with - just be sensible. ALL SRs that you meet are moisture cured !!!!!!!!!!!!!!!!!!!! Atmospheric water reacts with the SR to cause cross linking of the SR rubber. If the air is relatively dry it takes longer. If the air is completely dry then SR will; not set !!!. SR tubes are water proof and water vapor proof. Once you open them they are NOT water vapor proof - a tube of set of SR that is carefully sealed will set completely hard on months to a year. Storage in 100% dry air MAY work. To set right through water vapor from the air must penetrate the SR. Penetration rates vary from about 1mm/day to 3mm/day. If you make a very very thick blob of SR it can take many days to set in the middle. If you take two flat plates and overlap them and apply SR to the overlap the air path to the overlap is d/2 where d is the smallest overlap dimension and the path is through set SR and is very thin. SO an overlap SR join may take many many many days to set. Major SR makers recommend not using vast overlap in joins. The 600 pound gorillas of the SR market are Dow Corning, Shinetsu (Japanese) and maybe BASF (BASF are the 600 pound gorilla of ANYTHING chemical but nobody notices). There are many other brands and many are good but if it's made by DC or Shinetsu you know it's good. Not all brands are good. Some people put large amounts of filler in their SRs to the extent that it works poorly. DC do make some cheap lower performance NCSRs but even these work well for most purposes. DC and other large makers may sell specific grades in selected markets which are not available in all countries. eg they sell "Dow Corning Neutral Plus" oxime cure NCSR in Asia.Unlike most DC SR's it has no product number and US sources do not know of its existence. It costs a few $US a tube in eg Hong Kong and works well enough. Note that SR's are NOT water vapor proof. Water vapor will permeate through them but liquid water will not. So a container "sealed" with SR will have an internal relative humidity comparable to that outside it! SR is typically about 10x more water permeable than the EVA sealant/adhesive used to bond silicon "solar cells" & glass PV panels together. So a Glass fronted PV panel and a "waterproof" backsheet is also not in fact sealed and inside humidity levels are ~+ outside ones. Keeping LIQUID water off your components is what is required to prevent major corrosion. Fortunately. Corrosion still occurs with water vapour but at a vastl;y reduced rate due to the much lower concentration of reactants. The other requirement is a void-free bond to the component. If there are voids then water vapour can condense to form liquid water and allow corrosion at greatl;y accelerated rates. There are many many grades of NCSR - setting times vary from minutes to hours. Viscosity varies from very pourable to thixotropic. If you ask specific SR questions not covered here I may be able to answer them. "Silicone materials for Electronic Devices and Component Assemblies" - here which is probably the document that user 55online mentioned. This seems to be a very relevant document - it is specific brand related but contains much useful information. Be wary of products that are relatively heavy and relatively light relative to competing brands. Heavier ones tend to be filled with CaCO3 or similar. Light ones (which I've mainly seen in "Asian market only" offerings are filled with ???. SR when set will usually just float in water or perhaps sink slowly. Filled SR sinks more rapidly. Yes but beware that many "bathroom" grade sealants exude acetic acid when they set which will eat into copper. This link describes different types of sealant. Use an "electronics" grade sealant to avoid this problem. Alternatively you might want to look into potting compound. Yes, you can use many materials that aren't conductive or corrosive. Silicone has a slightly higher relative permittivity than air (3.6), but I don't expect this will cause problems, except maybe slight offsets at very high frequencies. Note that sealing will thermally isolate your product, so it might operate at a higher temperature. Be sure to allow for sufficient cooling for power devices. 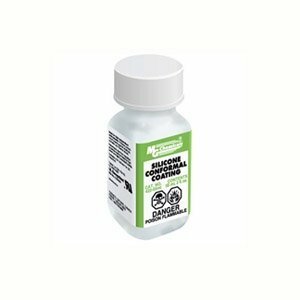 There are products specifically designed for waterproofing electronics called conformal coatings. Not the answer you're looking for? Browse other questions tagged waterproof insulation or ask your own question. Is hot melt glue suitable as potting compound? How can I isolate properly a home made PCB? Are there existing electronic sensors that can sense if underwater or not? Fixing a heated water dish: Pointers to a temperature table or guide for power resitors?